Luckily, Wataru-kun wasn't far from the courthouse. Knowing that Meguru-san was to be a witness today, he and Toshinari-san had come as moral support. The two of them were eating soba at a soba shop near the courthouse waiting for the verdict to be announced. Without even thinking about why he had been suddenly summoned, Wataru-kun looked at the witness stand with childlike curiosity. The judge's expression softened upon seeing Wataru-kun. He's probably soft on children because of his grandkids. ... It seems he's forgotten his job here and has fallen into the role of a grandfather. Regardless, I began my questioning. Wataru-kun cut me off in a panic and put a finger to his lips. Wataru-kun trembled nervously as he signalled me with his eyes. I immediately looked at Shirai-san. Surely he hasn't already threatened Wataru-kun? But Shirai-san simply looked downward, not even glancing in Wataru-kun's direction. Wataru-kun shrunk down cautiously, ready to hide under the witness stand at any moment. That's when a loud voice rang out. Toshinari-san shouted from the gallery. It wasn't very convincing when it looked like he was about to blow a vein. The judge warned, before urging Wataru-kun to testify. Wataru-kun nodded and began to speak. “Uuh... It was three days ago. I'd been playing with my friends at the park and was on my way home... Just after 6:00 probably. Oh yeah, I'd heard the clock chime for 6:00, so definitely after that. The murder took place at roughly quarter to six. The time seems to match up. Shirai-san folded his arms with a bored expression. It was a face that said he was fed up with this farce. Whether those are his true feelings or simply an act will be made clear soon. —Litterbugs like yourselves just toss your trash anywhere and it gets blown into the sea! Prosecutor Garyuu opened his mouth. Prosecutor Garyuu played his air guitar. He seems satisfied... but that was a pretty poor analogy. My only response was to bite my lip. I'm on the right track... I'm pretty sure of that. But there's no evidence. That black paper plane would have flown into the ocean. At a speed that Wataru-kun had to give up on chasing it. —No matter how much trash you scoundrels toss, I'll nicely catch it all! There's one person with a passion for preserving the ocean's beauty. The judge grasped his gavel. I raised my voice and looked to the gallery. Toshinari-san was glaring at a specific spot in the courtroom. The subject of his gaze was Shirai-san, who had a smug grin. I called out to the old man. Toshinari-san shifted his gaze to me, giving a solemn nod. ... Yes! Toshinari-san is a true guardian of the ocean! We're screwed if it's been thrown out already. However Toshinari-san simply turned away sulkily. Thinking he might be hard of hearing, I raised my volume, and Toshinari-san dialled the volume up even more for his reply. Wataru-kun said wide eyed from the witness stand. Toshinari-san's face went red with frustration. So basically, he was jealous that his grandson thought the black paper plane was cooler than his. How childish. Toshinari-san wordlessly gazed at Shirai-san again. Shirai-san's demeanour had changed. The sharp, intelligent impression he gave had crumbled and he looked down with a bitter expression. Toshinari-san spoke harshly to him. After muttering to himself, Toshinari-san turned back to me. 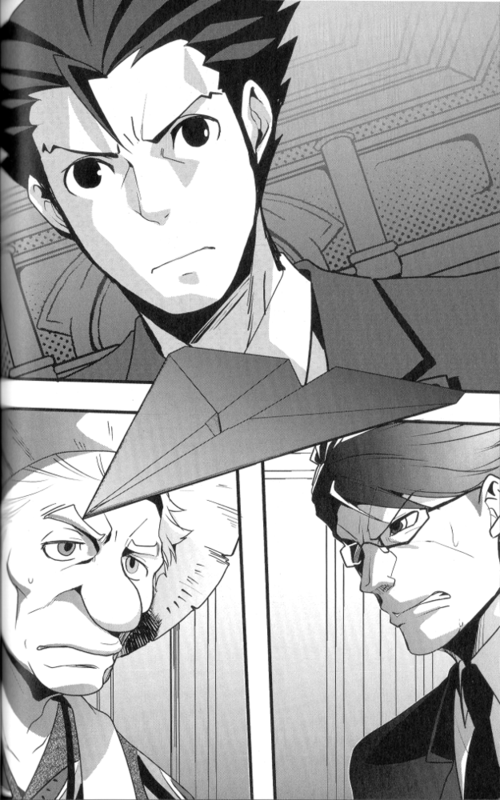 I looked straight at Prosecutor Garyuu. Prosecutor Garyuu clenched his fists on his desk. The judge spoke up, looking at the silent Prosecutor Garyuu. Having finally regained his composure, Prosecutor Garyuu lifted his head. Shirai-san flinched as his name was said. He looked as if he'd aged ten years within the past few minutes. Shirai-san groaned in a quivering voice. Shirai-san fell to his knees and screamed. A bailiff ran over and subdued Shirai-san as he continued ranting. The judge cleared his throat as he gently picked up his gavel. He brought his gavel down. The dry sound echoed through the courtroom. The silent gallery began to stir. Minuki, who had been in the gallery until now, also came down showing a victory pose. Odoroki-kun, sitting in the defendant's chair, gave me the first real smile I'd seen from him in a while. Despite the trial only lasting two days, it felt more like it had been two weeks, I let out a long sigh of relief.